front row from left to right: Dorothy White, Weldon Marshall "Pete" Baker, Martha Rose Kelleyh and Julie Wackerhagen. Lockhart High School's graduating class of 1938 celebrated their 68th reunion at Sirloin Stockade after the Chisholm Trail Parade on Saturday, June 10. Their entertainment was visiting and playing two games that improved memory skills. Two plants were given as prizes, and won by Morris White and Martha Rose Kelley. In 1938, Lockhart High School graduated 75 students. Attending this year's reunion was Martha Rose Kelley who was involved in the Lion's first band and pep squad, Julia Wackerhagen who was involved in the Lion's pep squad and tennis, Clarence Balser who was the local high school disc jockey, Weldon Marshall "Pete" Baker, Morris White who was involved in the Lion's basketball team, Lorene Graef who was involved in the Lion's pep squad and volleyball team, Verona Graef Harmon who was involved in the Lion's tennis team, and Dorothy White who was involved in the Lion's pep squad. The graduating class will meet again next year, at the same place and the same time for lunch at Sirloin Stockade. "I would like to thank Sirloin Stockade for always reserving the Lions' Den room for us " Lorene Graef said. 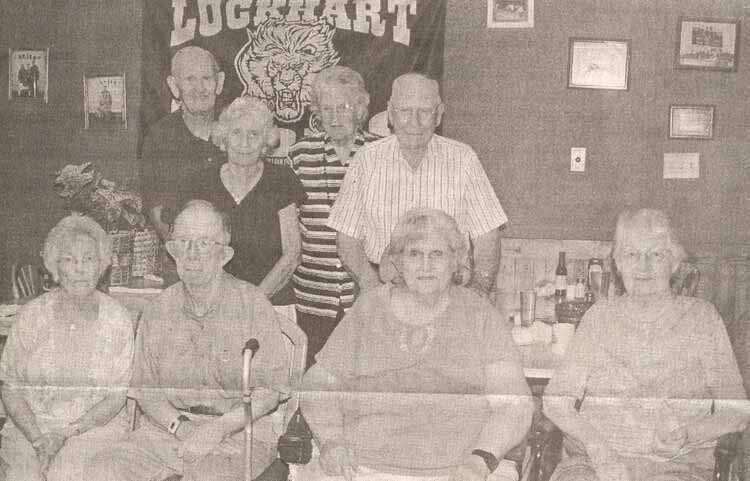 The Lockhart High School graduating classes of 1940 and 1941 met on Saturday afternoon, June 10, at the America Legion fireplace room after the Chisholm Trail Parade. Out of a class of fifty graduates in 1940 there were nine present, and out of a class of eighty-six graduates in 1941 there were sixteen present at the reunion. The following were present for the class of 1940: Stanley Balser, Frances Moor Duce, Evelyn Hanson Edmudson, Wiley Fowler, Lena Seeliger Jackson, Royce Kelley, Dorothy Nell Williams Nolte, Verna B. Hamblin Riddle, and Illine McGee Voigt. The following were present for the class of 1941: Frances Schubert Boyd, John Cardwell, George (Bubba) Chapman, Thomas Holland, Martha Lynn Randle Kumpf, Allene White McCury, Austin Pittman, James (Gip) Randle, Fleetwood Richards, Cecil Roberts, Daniel Ray Stasney, Herbert Ulbricht, Juanita Fowler Voelkel, Wilbur (Whizzer) White, Estelle Seeliger Wilson, Forrest (Jack) WIlson. Of particular significance was the fact that practically all of the young men graduates went off to fight in World War II soon after graduation. The Lockhart High School class of 1956 celebrated its 50th reunion during the Chisholm Trail weekend, June 10,2006. Classmates not only came from Texas, but as far away as Tennessee, Arkansas, Georgia, Nevada and Florida. Top: Jim "Potsy" Guckian, Vivian Tamayo Carrizales, Deloris Uhlig Malicoat, Phyllis Wegand Metcalfe, Rob Hewlett, David Dossey, Royce Schuelke, Barbara Fischer Robertson, Carlton Efird, Jim Stedman, Bubba Ross, Wayne Scott, Roger White, Karl "Gus" Brown and Wilma Fortman Finfrock "
Bottom: Gayle Pfeiffer Grantham, Mary Flores Carrizales, Jimmie Faye McMahan Kitchens, Carolyn Barber Hudler, Honored guest of the class Coach Jesse "Red" Burditt, Wayne Kieke, Ursula Jeffrey Gaines, Barbara Bodemann Kinstley, Toni Mojica Merrell, Inez Eppright, Patsy Chesser Askew, Mary Ann Callihan Holcomb. The Class has established the annual Coach Jesse N. "Red" Burditt Scholarship Fund for graduating seniors which hon-ors all LHS teachers, coaches and administrators. Tax deductible contributions are payable to the Lockhart ISD, P.O. Box 120, Lockhart, Texas 78644. It is important to designate your donation for the Coach Jesse N. "Red" Burditt Scholarship Fund. Also, include your name, address, and phone number. Any questions, please contact Jim & Linda Guckian,512-499-8738.